Plan your trip to Ålesund, Norway's most unique town with fairytale architecture in a remarkable natural setting. 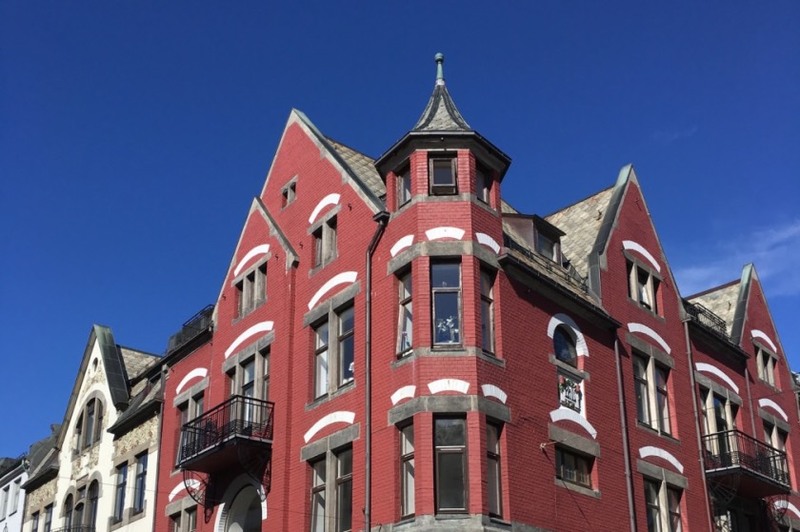 In stark contrast to other small Norwegian towns that are filled with white, dark red, and mustard yellow wooden houses, central Ålesund’s beautiful art nouveau architecture has more in common with Prague and Brussels than it does Oslo or Bergen. After a fire devastated the former wooden city in 1904, German money and young Norwegian designers came together to rebuild the city in the popular fashion of the time. Today, the turrets, towers and carvings of Ålesund stand head and shoulders above any other Nordic city as a shining example of the art nouveau style. The town is delicately balanced on a collection of islands of all shapes and sizes, helping to create beautiful vistas from almost anywhere in the town. Sunsets at the end of summer can be truly spectacular. 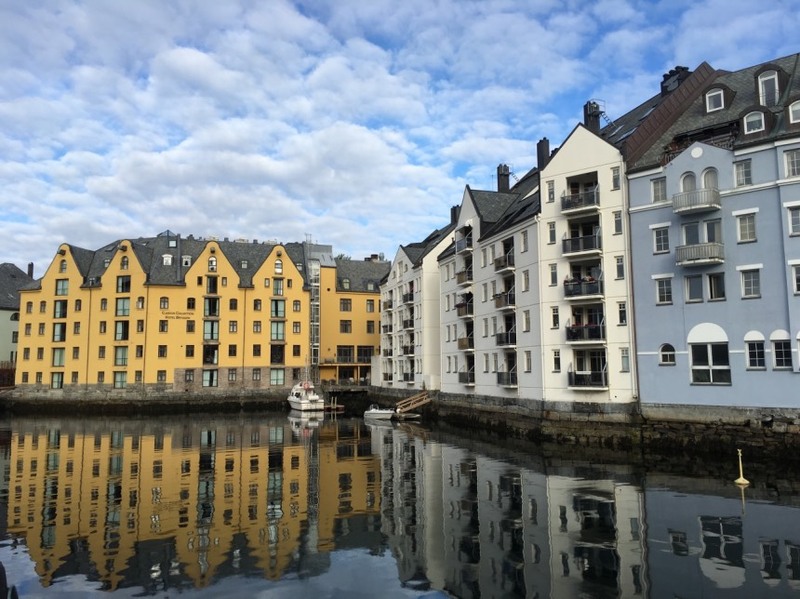 If time is short, simply take a walk around the waterfront to admire the unique architecture that sets Ålesund apart from other Norwegian towns. You don't need to join an organised tour. Just follow the waterfront and you'll find plenty to see in all directions. 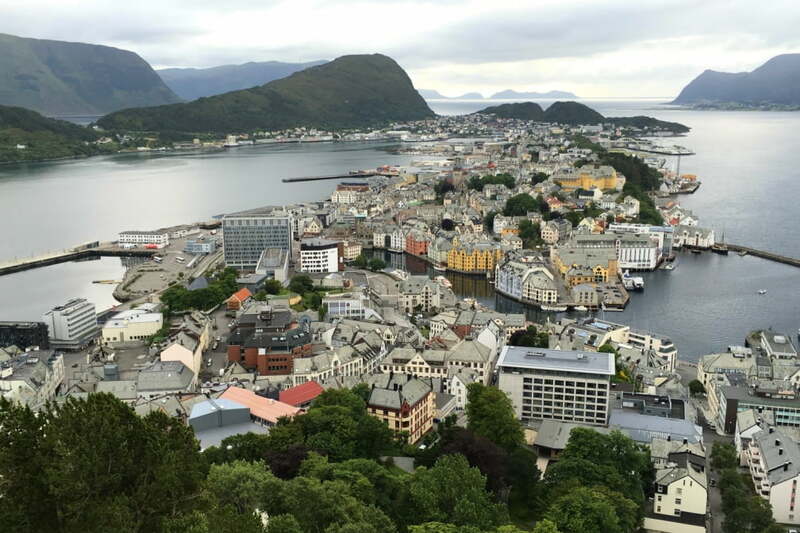 For more information on why Ålesund looks the way it does, head to the Jugendstilsenteret, a museum that retells the story of the town's fire and subsequent reconstruction. 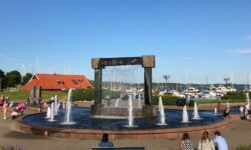 To find out even more about the city, Aalesunds Museum has artefacts, photographs and paintings from the reconstruction, World War II and other important periods. Another must-do is to climb the steps up Mount Aksla, the town's very own (albeit small!) mountain that offers a terrific view from its summit. There's more than 400 steps though, so only consider this if you have a reasonable level of fitness. There is however a cafe and restaurant at the top so you can at least refuel with some water and an ice-cream. 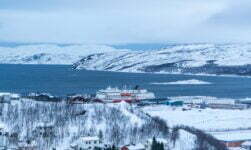 As an alternative, you can drive up through the town's suburbs, although parking can be an issue at peak times when you're doing battle with tour buses from the cruise ships. 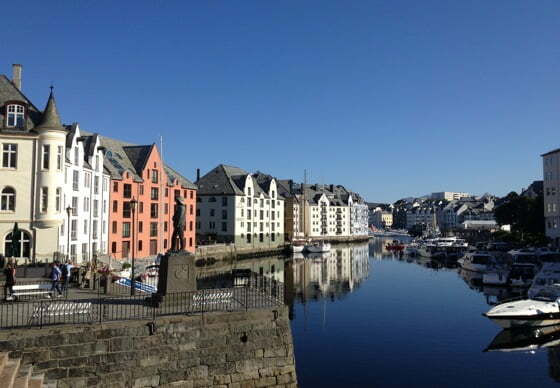 Find out more about Ålesund's top sights. 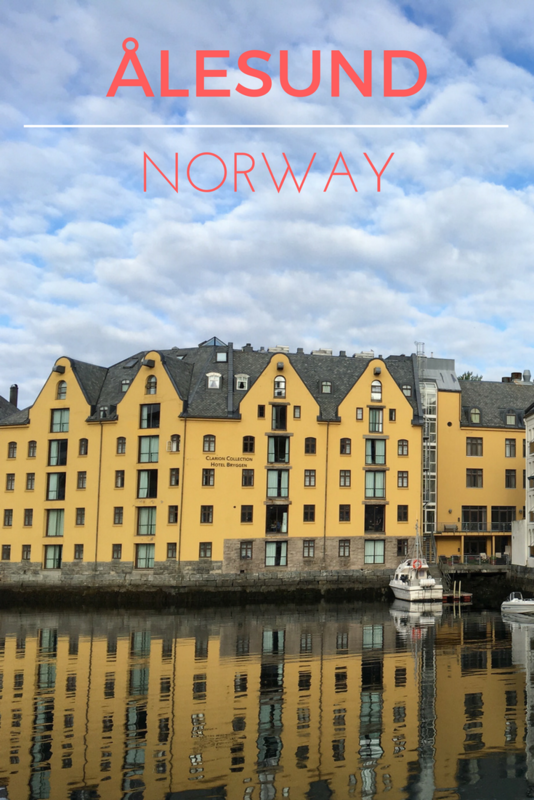 Although a popular destination, Ålesund's town centre is extremely compact so the number of hotel rooms is limited. Book well in advance to secure a spot if you want to stay in one of the town's more charming hotels. Here's our recommendations for the best hotels in Ålesund and a full review of the First Hotel Atlantica, which has a great location at the heart of the city. Many people arrive in Ålesund on a Hurtigruten or other cruise ship, as other public transport options are limited. 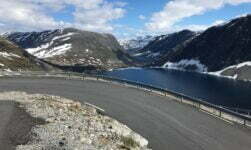 Driving from Trondheim takes around 5-6 hours, while driving from Oslo to Bergen can easily absorb an entire day. 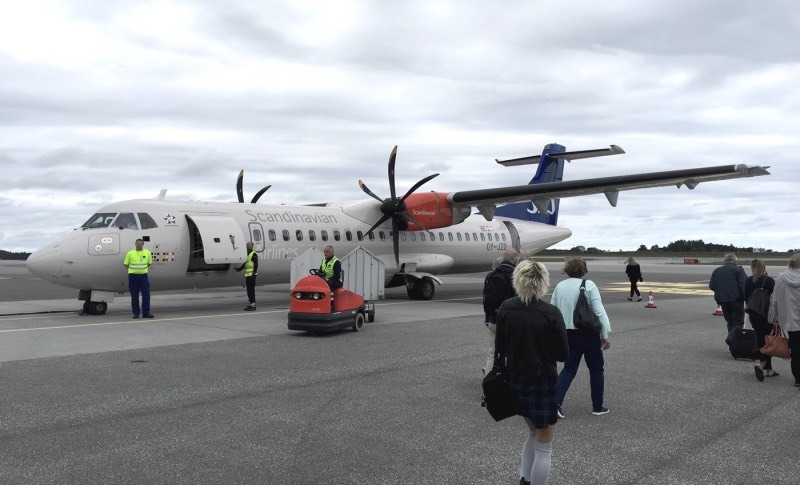 Flying to the city is of course possible, and cheap flights can be found in advance with SAS and Norwegian from Oslo, Bergen and Trondheim. The city has a local bus service but most visitors will simply be able to walk around the major sites. 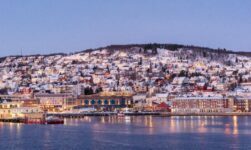 For more information, check our guide to transport in Ålesund. 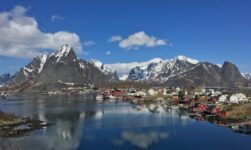 Ålesund is a great base for exploring the Geirangerfjord and Hjørundfjord, two of Norway's most picturesque fjords. 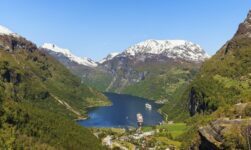 Hire a car and spend a couple of days touring the region, or take one of several organised boat tours from Ålesund. If you're driving yourself, don't plan a round trip within a day. 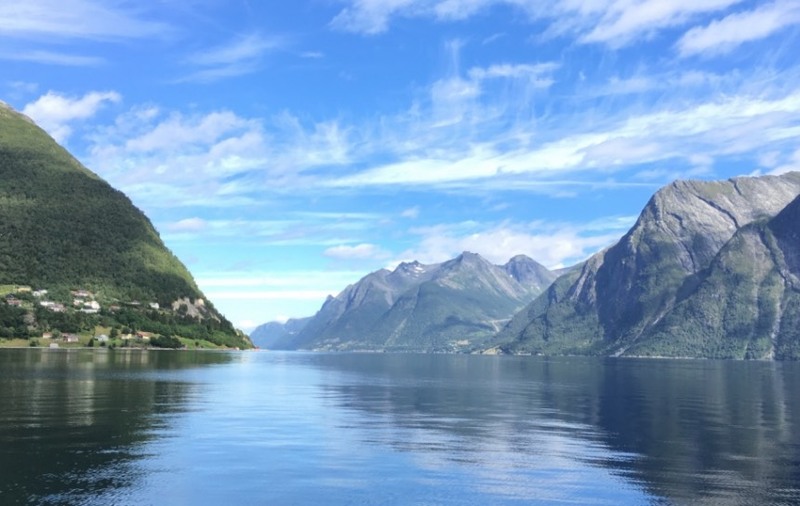 Spend a night in a hotel, hostel or cabin somewhere in the vicinity of the two fjords and reward yourself with a peaceful evening stroll along the waters edge. Closer to the town, the Giske archipelago (home to the airport) is full of nature trails, hiking opportunities, beaches and a 12th century marble church.